SGAI recently organised a Technical Seminar on Importance of Eco-Tex 100 Compatible Products. 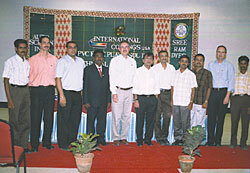 The seminar was conducted by Autoscreen India & International Coating Inc. (USA). Over 180 screen printers attended the Seminar. Mr. Stephan Kahane, President & Mr. Kent Hudson, Technical Manager, both from International Coating presented the seminar. The topics covered were ... bleeding, dye migration, ink selection, proper curing, boosting, fabric discoloration, special effects, different types of mesh, stencil systems, etc. The Seminar was supported by TEKPA and what's more it was translated in Tamil.